What's the difference between traditional hardwood and engineered hardwood? The answer is durability. 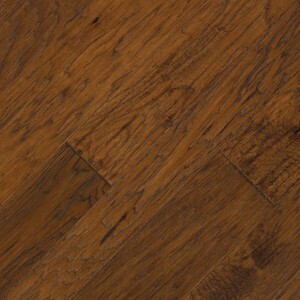 Earthwerks Brookstone hickory bronze engineered hardwood is handscraped and distressed for the appearance of solid hardwood, and it has a tough aluminum oxide urethane finish for added strength. This flooring can be glued or stapled to install. An important feature of this engineered hardwood is that each box contains 4-inch, 5-inch and 6-inch wide planks. When installed, this gives the floor a multi-width appearance. Engineered hardwood is constructed from a core of hardwood with a layer of hardwood veneer as the top surface. Because of the greater core stability, handscraped engineered hardwood floors can be installed in basements in addition to upper levels of a residence. They provide the same warmth and elegance as solid hardwood.